LEWISTON, Idaho — Each of the Cougars’ top three quarterbacks produced touchdown drives, and a wealth of receiving talent was on display in Washington State’s end-of-fall-camp scrimmage Sunday. 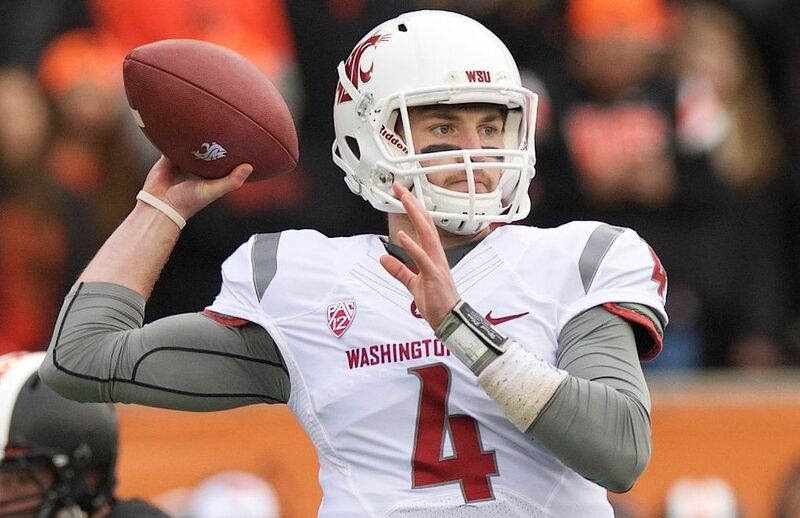 – Sophomore quarterback Luke Falk will go into fall as the starter, and he moved the offense efficiently at Sacajawea Junior High School, completing 76 percent of his passes (16 of 21 for 144 yards) scoring touchdowns on two of his three drives. He hit Daniel Lilienthal for a 7-yard touchdown, and connected with Dom Williams for a 18-yard score. – Peyton Bender isn’t quite at Falk’s level yet, but he completed 17 of 28 passes for 184 yards and a touchdown and had one very impressive series in which he drove the offense 50 yards to the end zone with three-straight completions — 22 yards to River Cracraft, 17 yards to Kyrin Priester and and 11-yard TD pass to Gabe Marks. Right afterward, Bender directed another 50-yard drive that culminated in a 3-yard Jamal Morrow touchdown run. That drive opened with a 31-yard fade pass to Kyle Sweet that really showcased Bender’s arm. – Tyler Hilinski (15 of 18 for 168 yards) has cultivated a solid rapport with freshman receiver Tavares Martin Jr. He and Martin connected seven times and the third string receiver finished with a team-high 105 yards and two touchdown receptions of 11 and 20 yards. Cougars coach Mike Leach called Martin “explosive” and said “he’s had a really good camp.” Martin will probably not be third-string for much longer. Still, he’ll have to fight for playing time in the Cougars’ crowded receivers room. – No interceptions from the QBs — always a good thing. The defensive was pretty active though. Safety Darius Lemora tipped a Bender pass that could have been an interception and LB Reggie Coates got his hand on a Falk pass. Safety David Bucannon put a big hit on Xavius Boone and knocked out a ball that would have been a reception otherwise. Still, no prizes for near misses, right? – On defense, CB Charleston White is still nowhere to be found. So freshman Darrien Molton and sophomore Marcellus Pippins were the first string cornerbacks. – Samoan freshman Logan Tago proved his worth as a pass rusher. He led the team with four sacks, all of which derailed Hilinski offensive drives. Kingston Hernandez had two sacks, while Ivan McLennan, Nnamdi Oguayo, Kache Palacio and Darryl Paulo each came up with one sack. – Of the three kickers who took field goals, only Erik Powell was perfect. Powell was good from 47 yards, 37 yards and 42 yards. Brett Schafer made a 37-yarder and a 42-yarder but missed from 47. Matt Abramo made one from 43 but missed from 37 and 47. Perhaps a little rusty after being limited in practice for most of camp?